Backed with a team of skilled professionals we are engaged in offeringPVC & Rubber Glovewith utmost quality to our clients. These are manufactured using quality basic material and are offered with PVC dipped cotton support for better gripping of the substance. 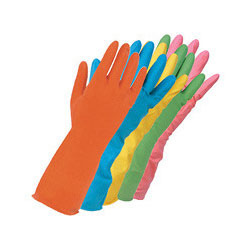 Our offered gloves are available in different specifications to meet the various requirements of the clients as well. We, “Pruthvi Corporation”, incepted in the year 1989, at Vadodara, (Gujarat, India) is reputed in its domain for offering products that are diverse in nature, yet are manufactured keeping in mind the requirements of customers. We are a well known manufacturer and supplier of excellent quality industrial Safety Products including Full Protection, Safety Shoe, Eye Protection, Road Protection, Disposable Item, Fire Protection, Foot Protection, Hand Protection, Industrial Protection, Boiler Suit and Industrial Helmet and many more. The entire range offered by us is designed as per the customer’s demands, as we also provide test certificates for color fastness and shrinkage. These are catering to the requirements of various applications in industries such as chemical, construction, factories pharmaceuticals, and road transportation.